1. Use lots of seasonal pines, simply arranged in a pretty vase — or several vases down the table. Accent the vases with lots of candles (votives, floating candles or enclosed pillar candles of various sizes). You could also add other vases, such as cylinder vases, filled with bright, shiny ornaments. This is a very festive look! 2. The simple use of a vase of branches — whether natural branches, or gold or silver or snow-covered — reminds us of “a cold winters’ night”. Again, dim the lights and use lots of candles. If the budget permits, you could add some flowers, such as hydrangeas, to the branches, with pine accents or other greens. 3. Not every centerpiece needs to have flowers! A beautiful box or cube filled with seasonal pine greenery, cones, sticks, berries and maybe ornamental kale can be the perfect addition to the table…..and likely will be a conversation starter at your holiday dinner party. 4. Use little vases or jars down the table — again with lots of candles. This spreads the focus down the entire table, and often will make your table seem longer or wider than it really is. 5. Use what you have — and improvise if necessary! Grab that evergreen wreath off the back door. Place it in the middle of your table. Add a few taller vases with candles or floating candles inside the middle ring. Voila!! Instant centerpiece! 6. If you are using fresh pine in your house or on your table, please be sure to add water to the vase, or container daily. Pine is a “heavy drinker”. It needs lots of water to stay pliable. Happy Holidays to all, if we can help you, please call! This entry was posted on December 13, 2018, in Exploring Colors, Ideas & Arrangements, Tid Bits and tagged centerpieces, christmas, Christmas Decorations, hanukkah, holiday, winter, winter decorations. 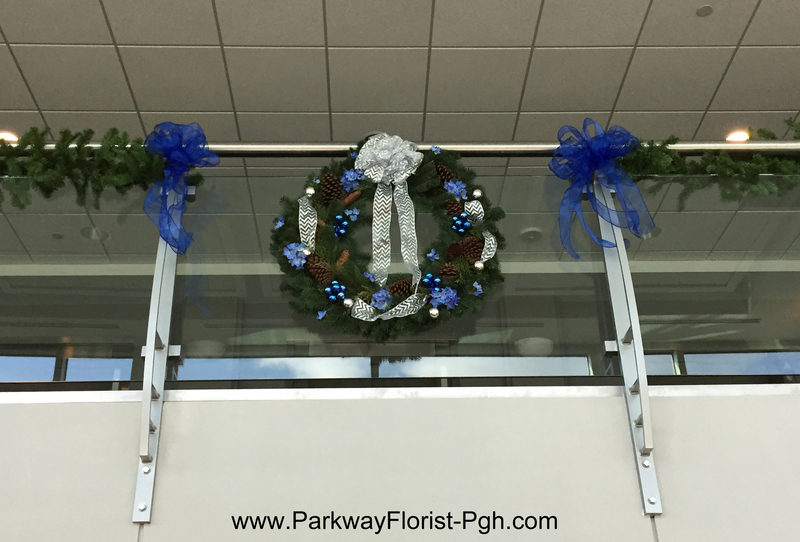 The trees are trimmed, the poinsettias are watered, the bows are tied neatly, we are ready for Christmas in a flowers shop! You better believe Santa has a lot on his plate for 2017, and of course he has lots of help to get it all done! 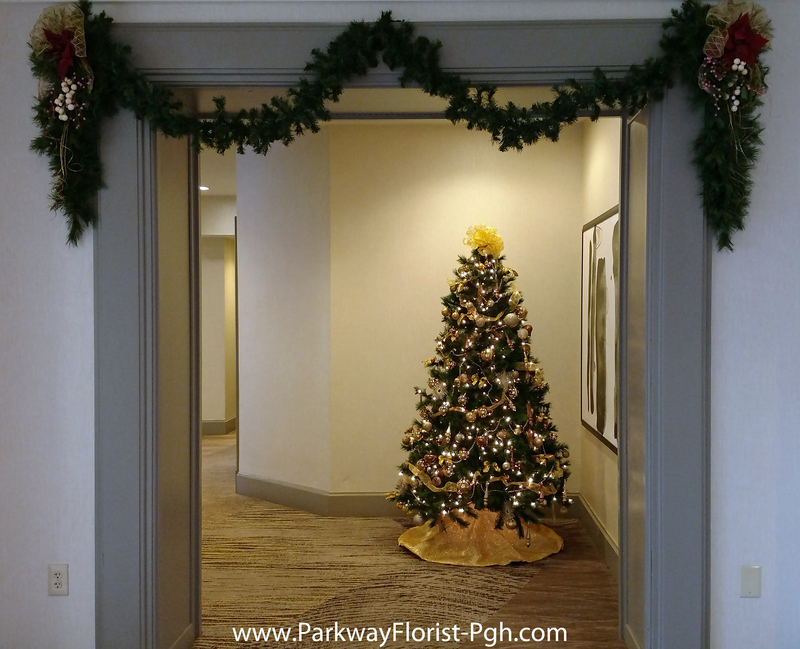 We had the pleasure of visiting some of out favorite local Pittsburgh businesses to bring the spirit of Christmas alive this year. 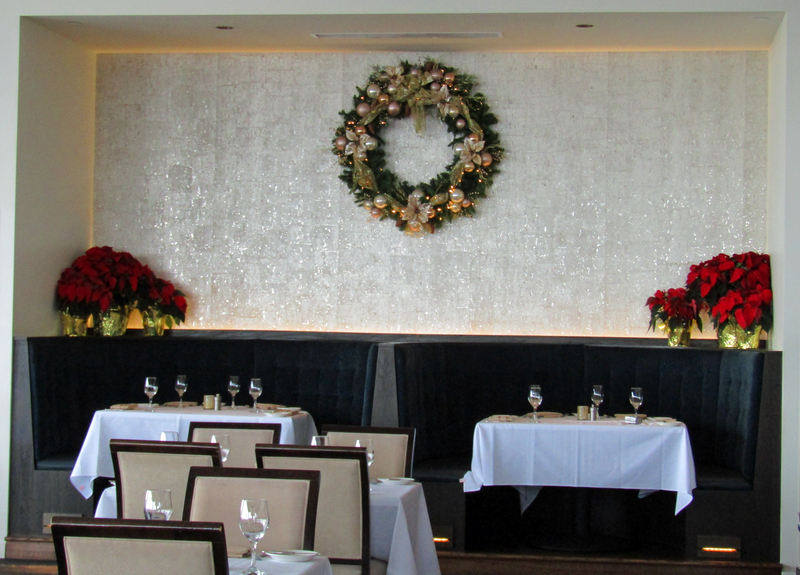 In classic Pittsburgh tradition, we prepared for light up night by decking the halls at Monterey Bay Fish Grotto located in Pittsburgh’s scenic Mt. Washington neighborhood. We started at the hostess station and worked our way throughout the restaurant. As guests ride the elevator up to the restaurant level, they experience the amazing scenic view of Pittsburgh’s downtown. 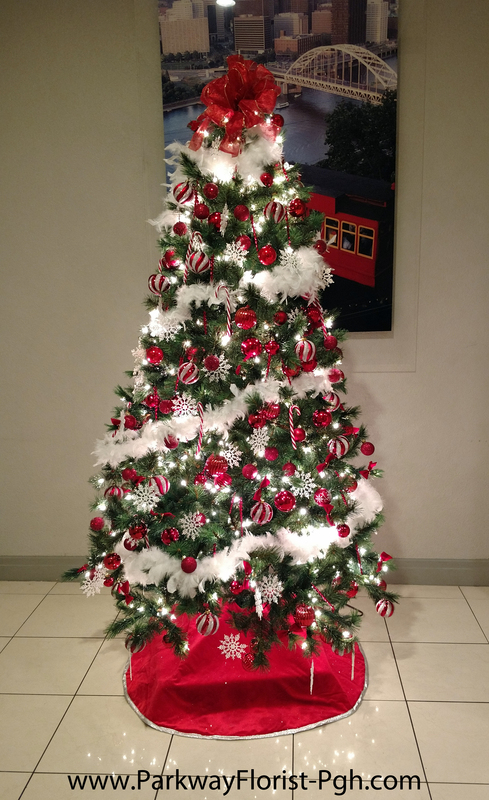 Once they step off the elevator, they are greeted by Monterey Bay’s tastefully decorated Christmas tree. 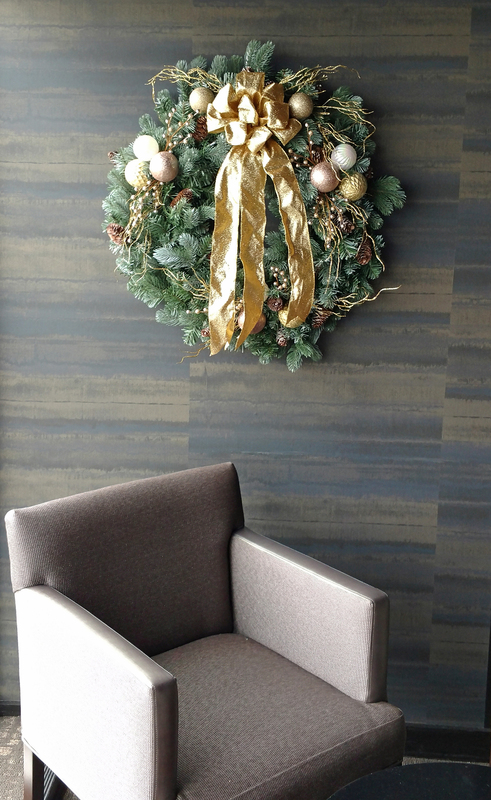 Trimmed with ornaments in hues of gold, champagne, ivory, copper, and brass, the tree coordinates with the rest of the restaurant’s decorations perfectly. 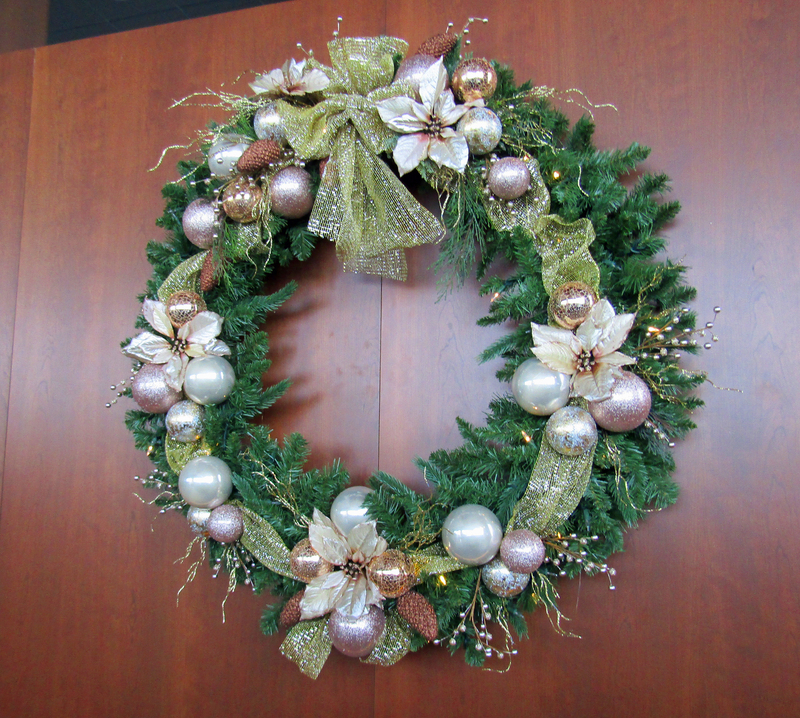 Several fresh and artificial pine wreaths decorate the walls of Monterey Bay for an understated but festive look. Once the ambiance is set, the seats are filled, and the view of the city is in sight, you know you’re in for a treat. Be sure to visit this holiday season! If lounging is more your style, we’ve also added decorations to the shadow boxes that decorate the wall above the comfy lounge-style seating area. 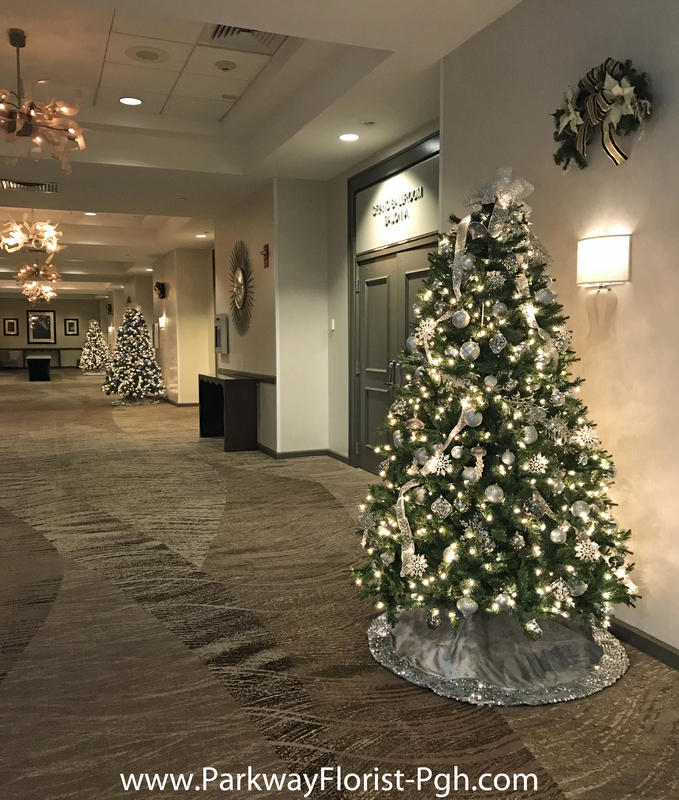 For banquets, Christmas parties, winter weddings, and special events, we decorate several Christmas trees that may be moved and used to decorate any number of ballrooms and areas throughout the hotel. For added festive touches, you might see a little of this and a little of that in all the right places. 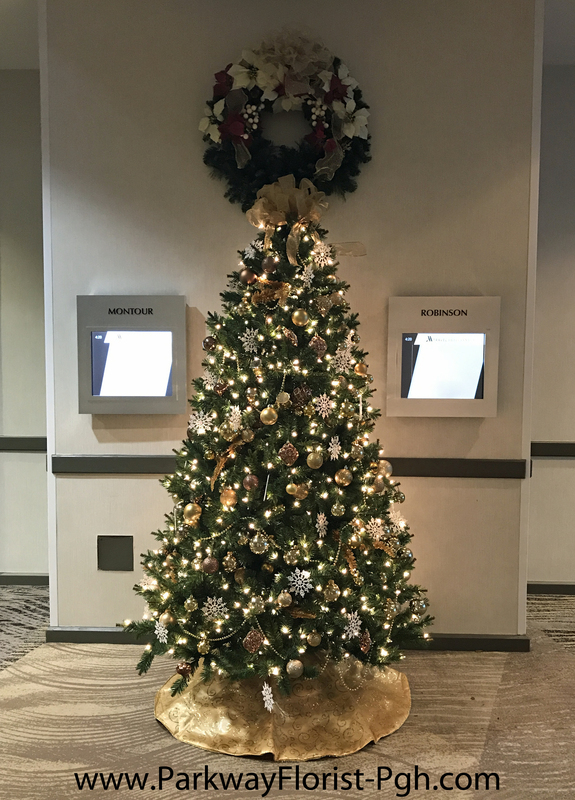 For those who spend the holidays away from home, it can be hard to get in the spirit, but that’s not the case if you’re staying at the Pittsburgh Airport Marriott. 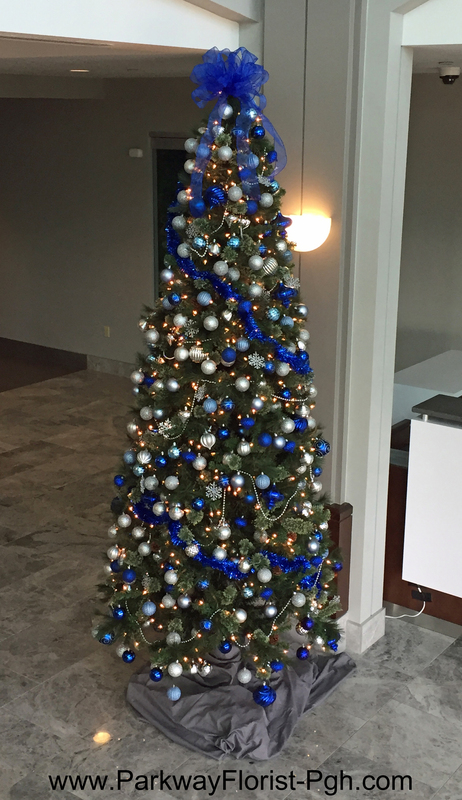 We also brought the holiday to the offices of ProMinent Fluid Controls and Calgon Carbon Corporation. 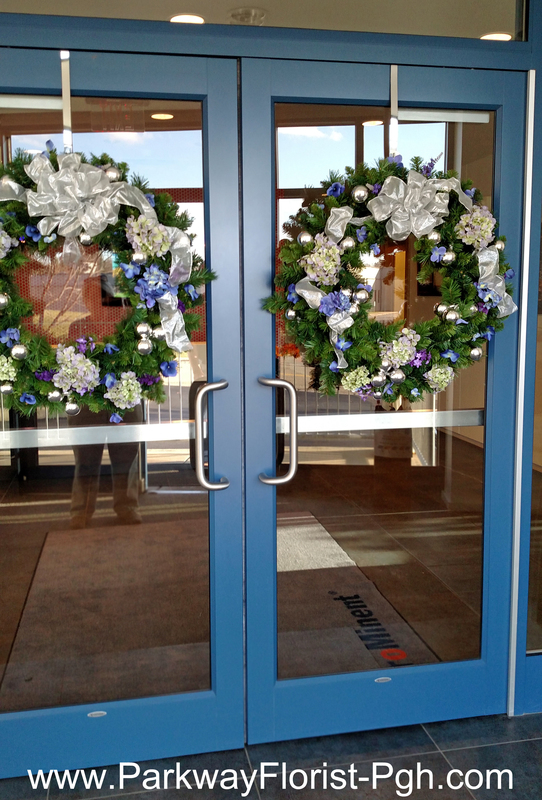 We do our best to work in the company’s colors each year. As you can see, We Simply Love Christmas! Happy Holidays to all……and hope you enjoy our team’s talents! To see more of what we are up to this holiday season, and the rest of the year, check out our Facebook and Instagram pages! 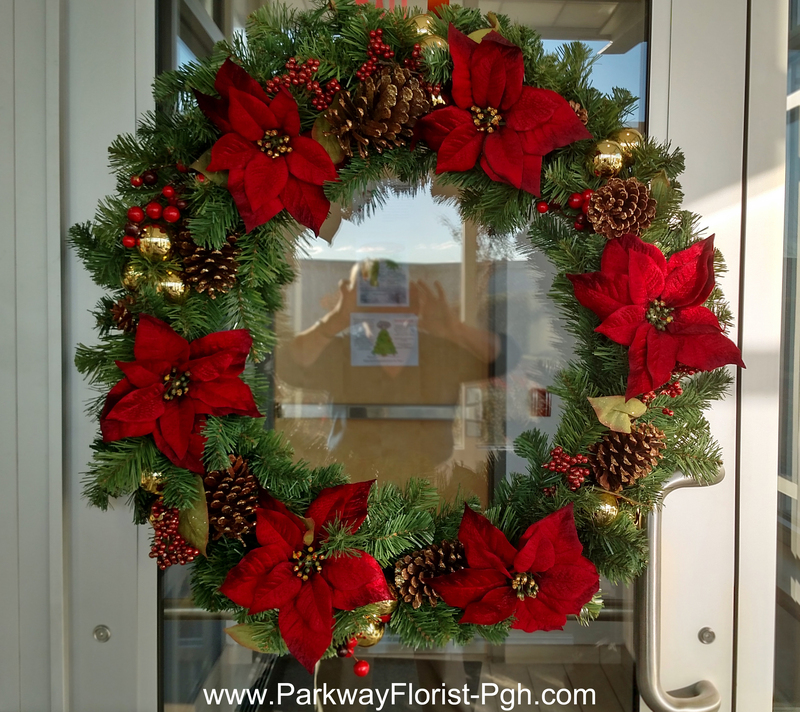 This entry was posted on December 6, 2017, in Tid Bits and tagged Christmas Decorations, Christmas Wreaths, Chritsmas Trees, Holiday Decorations, Pittsburgh Christmas, Pittsburgh Christmas Florist.